The Yelp part is the comments, guidance provided by users on specific SaaS offerings. It has the requisite bells and whistles, reputation management, up- and down-votes, user levels from Visitor > Contributor > Influencer > Expert with incentives … etc. 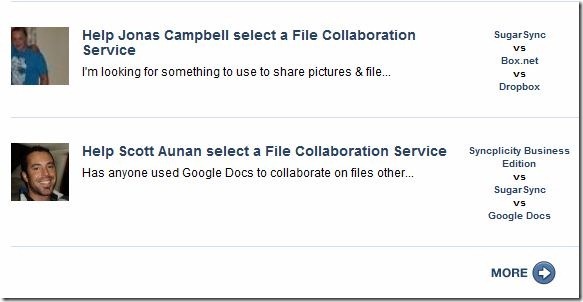 Jonas and Scott are looking for a solution in the same category: File Collaboration Software. Yet their top three candidates are different. There is no one-size-fits-all, obviously their needs / preferences are different, too. Let’s see what happens when I look for a solution in the same field. 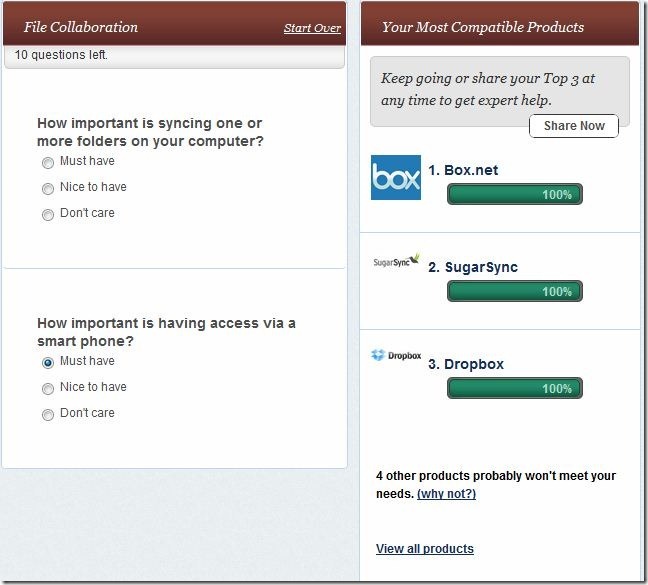 Having answered two of the dozen questions, I am down to 5 choices out of the initial 7, and my top three are SugarSync, Box and Sincplicity. Of course the ranking can easily change in the later steps, in fact the leader may very well drop out at any step. But what if the first requirement, smart phone access was a “must have” for me? Wow, right at the start we’re down to three, and they are NOT the same three as before. The expert configuration is a major value, before the social component would even start. Now, is there anything NOT to like here? Well, it’s what’s not on the site. It’s essentially a well-thought out framework, a shell that needs to be filled with content. And I don’t mean user contributions… picking the Product / Service categories, structuring the questions and the rating system behind it is huge work. So for now, OnCompare is a big promise … one to definitely keep an eye on – and participate.